There are four form controls (điều chỉnh hình thể). 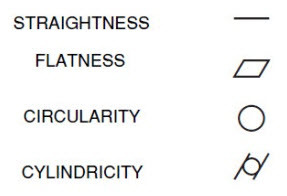 Flatness (mặt phẳng), Straightness (thẳng, không cong), Circularity (hình vòng tròn; dáng tròn), Cylindricity (hình trụ, cylindricity is a 3-Dimensional tolerance that controls the overall form of a cylindrical feature to ensure that it is round enough and straight enough along its axis). Practically form controls are the least used GD&T controls as other tolerances like location and orientation will have sufficient control to satisfy parts functional requirements and form. Form Controls Never Need a Datum Reference: As a general rule, apply a form (only) tolerance to a non-datum (số lượng đã cho; điều đã cho biết luận cứ) feature only where there is some risk that the surface will be manufactured with form deviation (độ lệch) severe enough to cause problem in subsequent manufacturing operations, inspection, assembly, or function of the part. Cylindricity: The condition of a surface of revolution in which all points of the surface are equidistant from a common axis. MMC or LMC is not applicable. 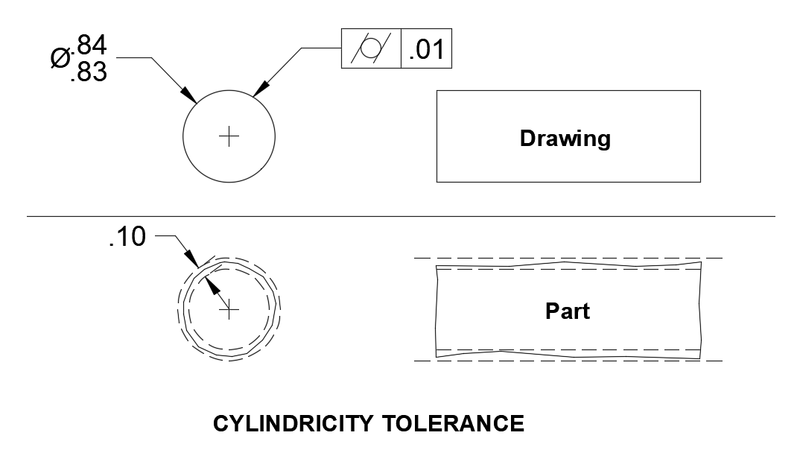 Cylindricity Control: A cylindricity (tính chất hình trụ) tolerance specifies a tolerance zone bound by two concentric cylinders within which the surface must lie. A cylindricity control applies simultaneously to both circular and longitudinal elements of the surface. Applications used cylindricity tolerance: A real-world application of a cylindricity tolerance is to protect the function of sealing surface. Cylindricity is a fairly common callout for shafts, pins and any critical cylindrical element. When a part needs to be both round and straight along its axis, such as a sliding shaft, or a dynamic locating pin, cylindricity is usually called out. You will see this GD&T symbol very often in automotive drawings and mechanical systems. Ex: A bushing that was to be pressed into a housing, the bushing would take the form of the housing bore when inserted. To ensure that the bushing maintains its round shape, and wears evenly along its surface, the housing bore needs to be very cylindrical. 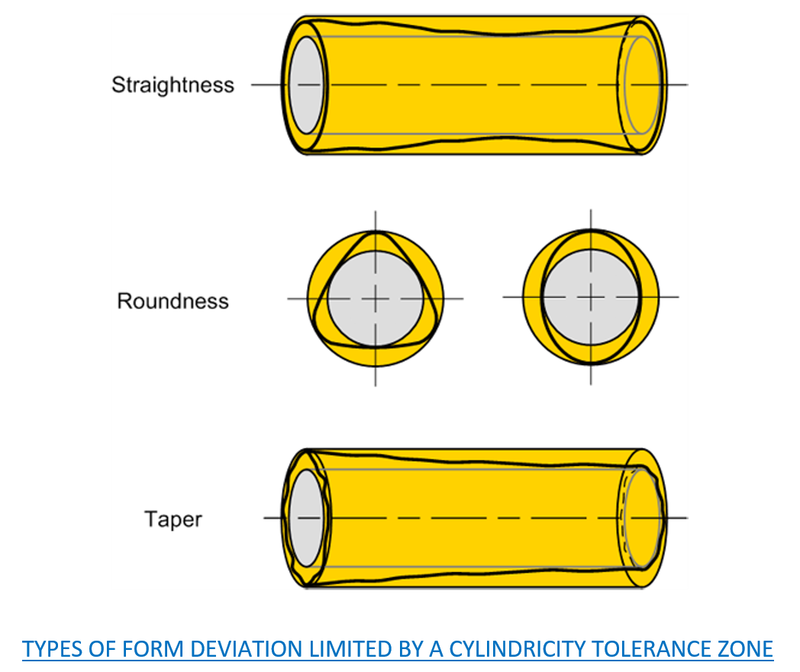 Cylindricity Tolerance: A cylindricity tolerance is a composite control of form that includes circularity, straightness, and taper of a cylindrical feature. A cylindricity tolerance specifies a tolerance zone bounded by two concentric cylinders whose radii differ by an amount equal to the tolerance value. In this figure, the entire feature surface shall be contained within the tolerance zone (between the two cylinders). The tolerance zone cylinders may adjust to any diameter, provided their radial separation remains equal to the tolerance value. This effectively removes feature size from cylindricity control. As with circularity tolerances, a cylindricity tolerance must be less than half the size tolerance to limit multi-lobed form deviations. Since neither a cylindricity nor a circularity tolerance can nullify size imits for a feature, there's nothing to be gained by modifying either tolerance to MMC or LMC. A cylindricity tolerance is not considered an indirect (gián tiếp) form (hình thức) tolerance (kích cỡ, khối lượng.. của một bộ phận có thể dao động mà không gây tác hại). 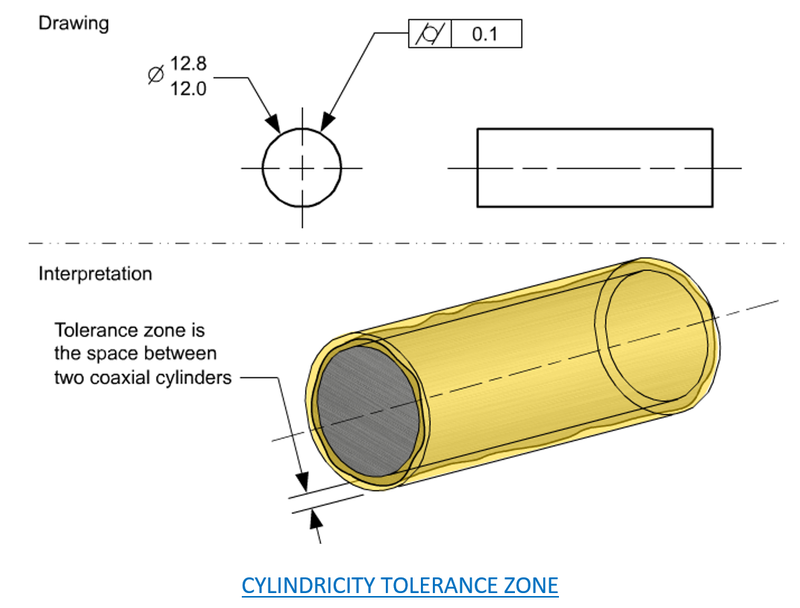 Cylindricity Tolerance Zone: The cylindricity tolerance zone is the volume between two coaxial cylinders. The radial distance between the two cylinders is the value of the cylindricity control tolerance. The surface being controlled must lie within the volume defined by the tolerance zone. The tolerance zone cylinders may adjust to any diameter, provided their radial separation remains equal to the tolerance value. This effectively remove feature size from cylindricity control. As with circularity tolerances, a cylindricity tolerance must be less than half the size tolerance to limit multi-lobed form deviations. Since neither a cylindricity nor a circularity tolerance can nulify size limits for a feature, there's nothing to be gained by modifying either tolerance to MMC or LMC. It's used when cylindrical part features must have good circularity and straightness, like pins or camshafts. 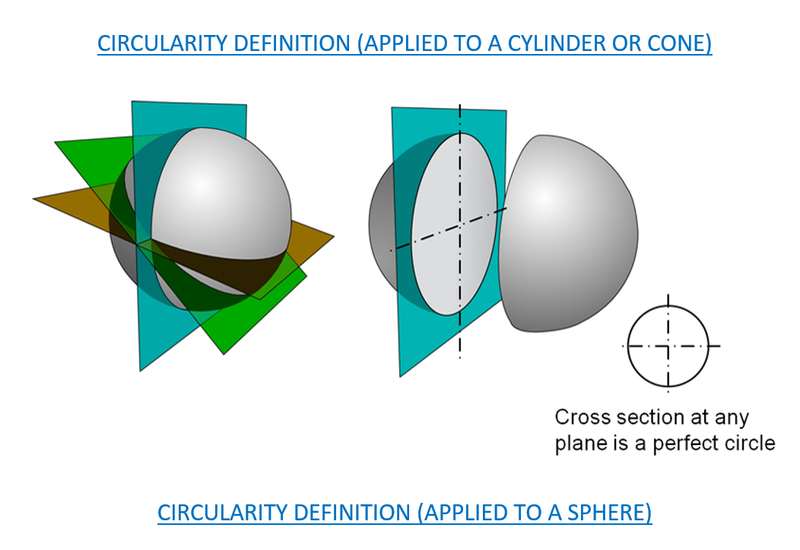 While circularity applies only to cross sections, cylindricity applies simultaneously to the entire surface. 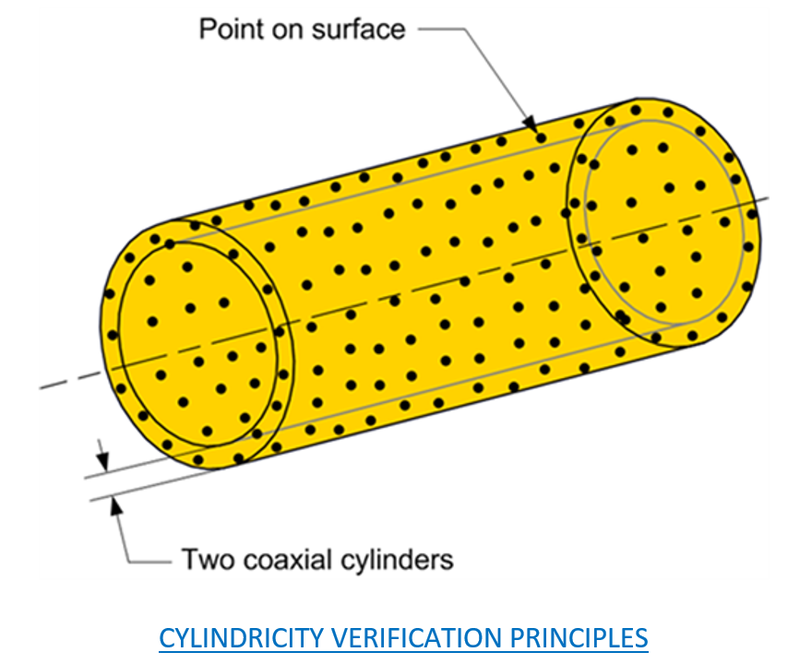 Cylindricity is a 3-Dimensional tolerance that controls the overall form of a cylindrical feature to ensure that it is round enough and straight enough along its axis. 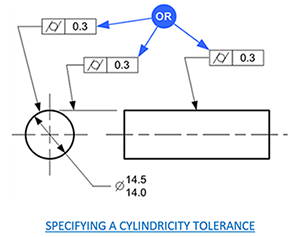 Cylindricity is independent of any datum feature the tolerance needs to be less than the diameter dimensional tolerance of the part. How rule #1 effect on cylindricity deviation? Rule #1 limits cylindricity deviations to be equal to the size dimension tolerance. 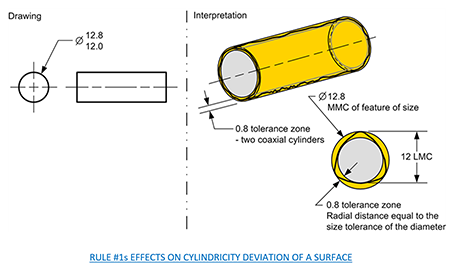 When cylindricity tolerance is applied to a cylindrical feature of size (and Rule #1 applies), the cylindricity tolerance value must be less than the size dimension tolerance value. In this Fig. (0.8 is the maximum cylindricity deviation permitted). Which types of form deviation limited by a cylindricity tolerance zone? Taper, circularity, and straightness. Deviations in location or orientation can’t affect the verification of cylindricity tolerance. 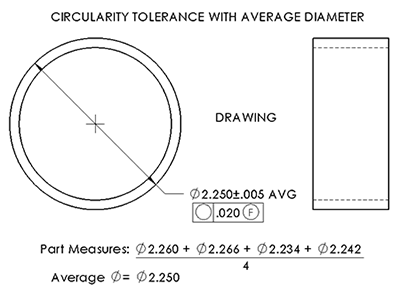 Circularity or Cylindricity Tolerance with Average Diameter. The thin wall bushing in the right Fig. is a typical of a nonrigid part having diameters that fit rather closely with other parts in assembly. If customary diameter size limits were specified, no matter how liberal (nhiều, rộng rãi, tự do), their inherent (vốn có, cố hữu) circularity control would be overly restrictive for the bushing in its free state (unassembled). The part's diameters in the free state cannot and need not stay as round as they will be once restrained in assembly. This is the way to control size-in-assembly, while at the same time guarding against collapsed (đổ, sập, sụp, đổ sập) or grotesquely (lố bịch, kỳ cục, kệch cỡm) out-of-round bushing that might require excessive assembly force or jam in automated assembly equipment. The solution is to specify limits for the feature's average diameter along with a generous circularity tolerance. Where a diameter tolerance is followed by the note AVG, the size limit boundaries described in (gd&t fundamental rules) do not apply. Instead, the tolerance specifies limits for the feature's average diameter. Average diameter is defined somewhat understandably as the average of at least four two-point diameter measurements. A contact-type gage may deflect (uốn xuống, võng xuống) the part, yielding an unaccpetable measurement by (3.1416). When the part is restrained in assembly, its effective mating diameter should correspond (phù hợp; không trái ngược với cái gì hoặc với nhau; tương ứng) closely to its average diameter in the free state. The tolerance value must be less than the size tolerance. Perfect cylindricity at MMC is required. The cylindricity tolerance limits the taper deviation of hole or shaft. How to verify a cylindricity tolerance applied to the surface of a diameter? The inspection methods for a cylindricity tolerance must be capable of collecting a set of surface points. When verifying a cylindricity tolerance, the inspection process must be able to identify the radial distance between two coaxial cylinders that encompass (bao quanh, bao gồm, chứa đựng) all points of the surface. Which deviation is limited by a cylindricity tolerance but not straightness or circularity tolerance? Taper. 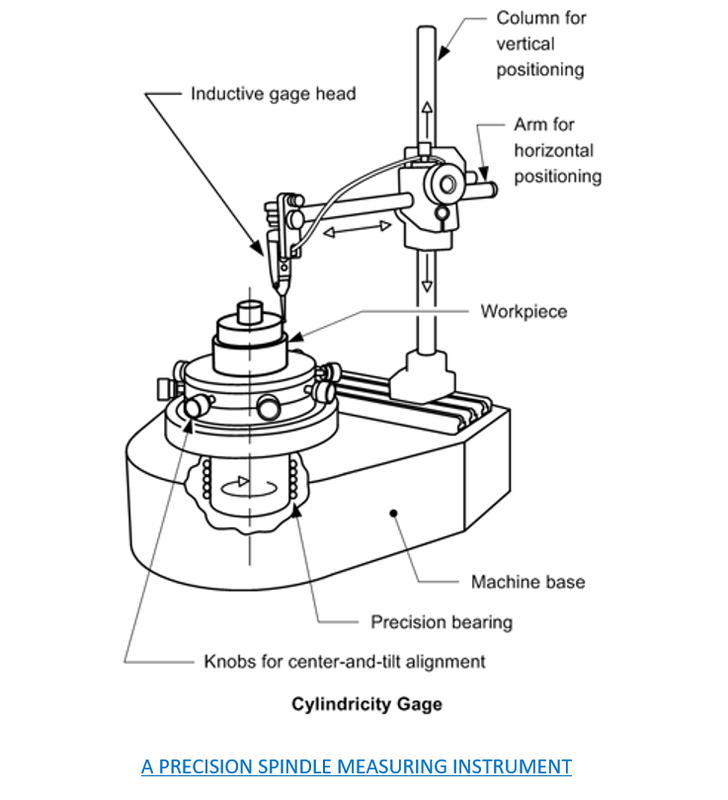 A cylindricty gage is a precision spindle measurement instrument. Cylindricity is measured by constraning (chế ngự, ghìm lại) a part on its axis, and rotating it around while a height gauge records the variation of the surface in several locations along the length. The height gauge must have total variation less than the tolerance amount.